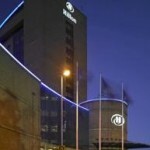 Hilton Belfast is a five star hotel near the Waterfront Hall near the river Lagan in Belfast. Some of the rooms have wonderful view towards the river and in the Sonoma restaurant you can eat traditional Irish lamb. The hotel is central, near Victoria Square, Odyssey Arena and other attractions, and inside the hotel you find all luxurious services you will need. WiFi is available against a very high charge. If you arrive with train from for example Dublin, then this hotel is located very close to Belfast Central, the main railway station.